Figure 2846 shows a failing DUT (Device Under Test) that is a mixed analog-digital DUT with three power supply pins (Vsup1, Vsup2, and Vcc). Vcc is a power supply pin of the OPAMP block, while Sleep5V is the internal power supply signal of SOG and other blocks. The defective location was in the OPAMP block, however, there was no visible leakage spot in the OPAMP block in the IR-OBIRC image (Figure 2846 (b)) when the DUT is power-on even though an obvious Icc leakage has been detected. In stead of appearance of spots in the OPAMP, abnormal spots appeared in the Sea of Gates (SOG) as shown in Figure 2846 (b). These spots were actually relevant to the leakage current in the OPAMP block. As indicated in Figure 2846 (c) the Icc current flowed through a bridging defect (see Figure 2846 (e)) to the signal sleep5V. 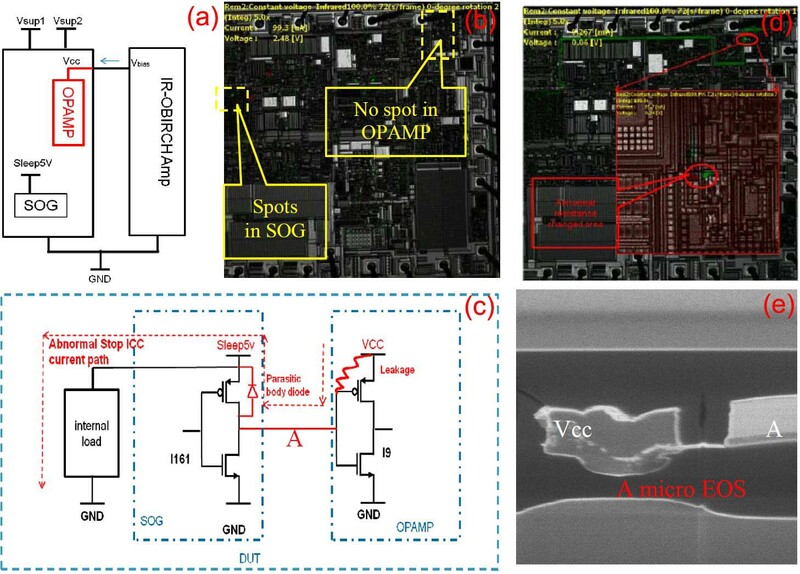 A forward-biased parasitic body diode was built from Vcc to sleep5V. Besides driving a lot of blocks in the DUT, the sleep5V gained higher current when the parasitic body diode is stimulated by the scanning laser. However, this stimulated location is actually different from the defective location. By changing the power supply configuration, the defective location in the OPAMP block appeared as shown in Figure 2846 (d). Jinglong Li; Gaojie Wen; Joe Yu; G. Song, Die-level leakage current path analysis based on IR-OBIRCH technology, 2012 19th IEEE International Symposium on the Physical and Failure Analysis of Integrated Circuits (July 2012), pg. 1-4.